As the semester winds down, I write with great enthusiasm to provide an update on Year One of the Ford School’s five-year Strategic Plan for Diversity, Equity, and Inclusion. As a school community--and indeed as a University and a nation--we have much work to do to tackle the inequalities that plague our world. But I am heartened by what’s been done here this year, and by the many ways we’ve found to build on longstanding commitments and on the intrinsic ties between diversity issues and the field of public policy. So together, let’s take a moment to reflect on and celebrate our work. I’ll note that this email reflects an incomplete accounting of all that’s been done--and that’s a good thing! There are so many contributions and initiatives to note--made by so many members of our community. I’m proud and grateful that you--faculty, staff, and students alike--have stepped forward to advance these efforts in your own way, using your own talents. That said, Associate Dean Paula Lantz has shouldered a mighty load as the school’s faculty lead for DE&I initiatives this year. Please join me in thanking Paula for her tireless, dedicated, and creative leadership. I’ll draw attention to just a few highlights from each of our strategic plan’s four overarching objectives. For much more information on these and many otherdiversity, equity, and inclusion-related stories from this past academic year,please take a look at this round-up item on our website. 1. The first goal for year one of our DE&I plan was to diversify ‘who we are’. Susan Guindi’s team worked with Paula and the Executive Committee to develop all-new student recruiting plans for the BA and graduate programs. The early results have been very promising. Please click here to read more about the school’s expanded student recruiting efforts. We developed and institutionalized new hiring protocols for all faculty searches, including training for search committee members. We built a tremendouslydiverse pool for this year’s search, and successfully hired two new faculty members who add diversity in terms of their ethnic backgrounds, disciplines and research agendas. And we’ve posted a new DE&I officer staff position (with support from the Provost Office) to serve as both an instructor and as the staff lead for diversity,equity, and inclusion initiatives. The applicant pool is very strong, and we’ll be bringing candidates to campus in May (we’ll seek students to be part of the selection process). 2. Our second central goal was to diversify ‘what and how we teach’. The year’s DE&I activities started with workshops for all faculty and GSIs, tailored to our own environment. We also 'changed what we measure' by adding new questions to course evaluations to solicit student feedback on DE&I issues in the classroom. I’m particularly pleased to note that the BA curriculum underwent a formal program review this year, with significant input from faculty and students. Many thanks to Sharon Maccini, our BA Program Director, for her excellent leadership of this important effort. We made a number of changes to our BA program as a result, including new requirements for course content related to values and ethics in public policy decision making, and the importance ofdiversity, equity and inclusion in public policy practice. 3. Our third top-level goal was to promote a climate that is equitable and inclusive. The newly-formed Student Leadership Council has provided invaluable input to administrators on efforts to enhance the climate of the school. The Council includes student organization leaders from our undergraduate, Masters, and PhD programs. And it’s been another extremely active year in terms of events and activities that foster widespread participation and opportunities to engage with and celebrate diversity. Formal public events included a community voices panel on the ongoing crisis in Flint, a major symposium honoring the Reverend Jesse Jackson, a panel on sexual violence on college campuses, the public event launching Kristin Seefeldt’s new book on race and socio-economic inequalities, and the EPI event on inequities in public schools. Less formal highlights included faculty-led brown bag discussions on the new Administration's policies, a staff podcast discussion and post-election conversation, movie nights, and our all-school read of Just Mercy. Student-led initiatives included Out in Public’s advocacy training, a joint WGPP/SCPP event featuring women of color in policy leadership roles, and a long list of other activities. 4. The fourth overarching goal of our plan was to build on and promote the school’s strength around research and policy engagement for diversity. It’s been gratifying to see a brighter light shine on the wide-ranging work our faculty do to address inequities across many policy arenas and many disciplines. Luke Shaefer’s leadership of the new Poverty Solutions initiative has brought tremendous energy to some of that work. Sue Dynarski continues to bridge world-class research with highly-effective dissemination and policy engagement. And there’s so much else: click here to read an article from the Spring edition of State & Hill that highlights recent work by Brian Jacob, Liz Gerber, Paula Lantz, David Thacher, Betsey Stevenson, Shobita Parthasarathy, and Ann Lin. 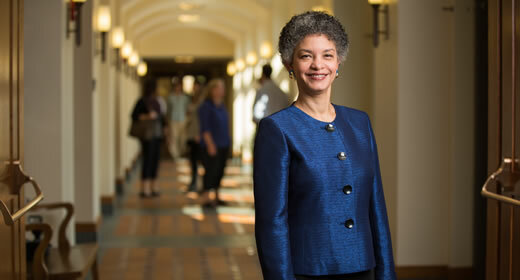 Friends, the Ford School’s commitment to diversity, equity, and inclusion predates my leadership by decades, and it will continue long after I step down as dean. I’m proud to have been a part of it. Year Two of our current DE&I plan will see these and other activities accelerate and grow as we move through a productive cycle of planning, implementing, evaluating, and improving. Thank you for all of the work we’ve done together this year!